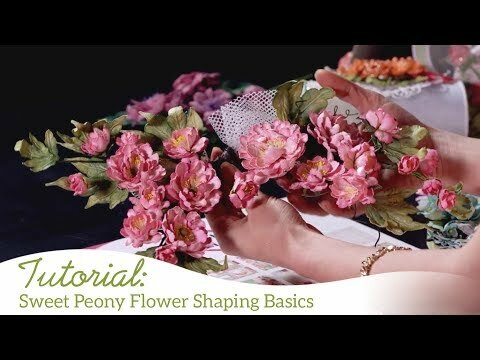 Watch this video for shaping tips and techniques with the Sweet Peony flower: https://youtu.be/L9_MLkvpGPQ. Watch this video for tips and techniques with the Foldout Card and border dies: https://youtu.be/wxX94X84kUo. 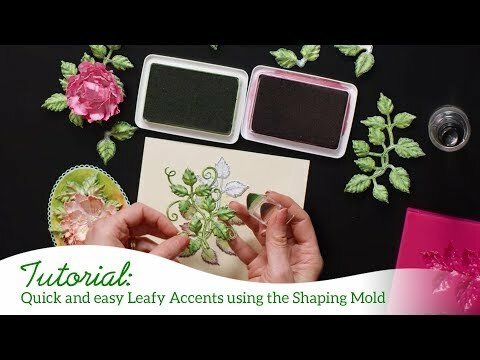 Watch this video for tips and techniques with the shaping molds: https://youtu.be/FSdPL7nXvQE. Instructions: Finished card is 6" x 6". Start with a 6" x 6" white foldout card. Cut panels from patterned paper to cover each panel. Using the Border Basics die, cut top edge of all pattered paper panels to coordinate with foldout card, ink edges with Garden Patina ink. Glue all panels to foldout card. Stamp several sets of Sweet Peony flowers on white cardstock with Garden Patina, Vibrant Fuchsia and Bright Tangelo ink, color flowers with same color inks using a precision sponge dauber, cut with coordinating dies. Once cut, color backs of flowers as will. Shape all flowers with flower shaping kit. Fuchsia flowers - layer 3 flowers each and glue. Medium flowers - layer 2 flowers each and glue. Small flowers - single. Pierce center of flowers with needle tip and insert flower stamens. Stamp several Leafy accents images on white cardstock with Leafy Green ink, color with same ink and a touch of Bright Tangelo, cut with coordinating dies. Shape with coordinating shaping mold. Cut a decorative piece from vellum paper with die from Frame a Card die set, score lines and fold to create fan shape as pictured. Glue all leaves and flowers as pictured. Add glitter to edges of petals on all flowers.